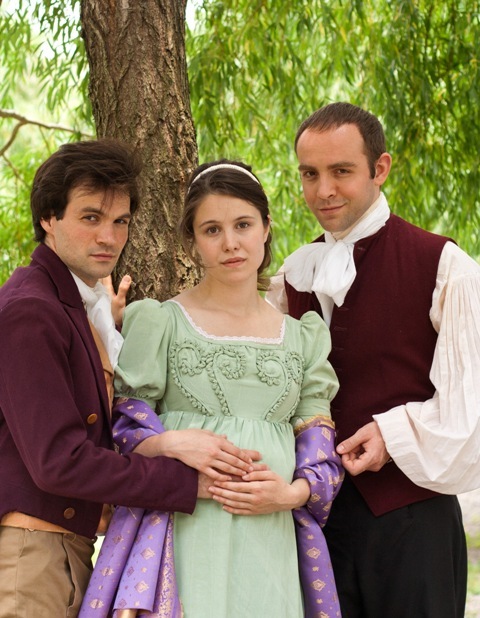 Nate Gundy (Percy Shelley), Julia Specht (Mary Wollstoncraft Godwin), Victor Shopov (Lord Byron). Photo by Alison Luntz. Hideous Progeny by Emily Dendinger. Holland Productions, Boston Playwrights’ Theatre, 7/9/11-7/23/11, http://www.hollandproductions.org/. Mary Wollstonecraft Godwin’s understanding of the gravity of creation led to one of the most famous horror tales of all time: Frankenstein. Emily Dendiger posits that this knowledge came from Mary’s own life and relationships in the play Hideous Progeny. Most generations struggle between rebellion and responsibility; the choices we make create the world that we live in. Mary’s future husband, Percy Shelley, speaks of and practices “free love” and ideals, but ignores the monsters he releases. Hideous Progeny haunts Mary Godwin and the audience with the question: do you run away from the monsters or do you face them?